In 2001 my husband, Bob, took a job in the United Arab Emirates working for an aviation company as a helicopter pilot in support of offshore oil production.We sold everything we owned except our 37-foot Burnscraft, which we keep at a marina in Penetang, Ontario, at the gateway to the 30,000 Islands, and which serves as our summer retreat and Canadian "home." Bob moved into the company accommodations on the outskirts of Abu Dhabi, a "workers&apos; camp" built some 30 years ago for single men. He had a bedroom and shared the rest of the living spaces with eight other men. I would be one of just a handful of women living in the camp. When I joined Bob, he informed me that I would have three hangers and two shelves in the wardrobe for my clothes. We soon discovered that we could easily live in a small space with just a few things. Bob, with me as his helper, had always had a project on the go, whether it was house renovations or restoring cars and boats. He missed his workshop and garage, and it wasn&apos;t long before we found that we needed a project to help fill our spare time. Of course, we missed having a boat, especially since we were now far from the Canadian winters. Our retirement dream had been to live on a boat, perhaps in some exotic location. So we naturally started seriously looking for a boat project. Bob searched the Internet for hours, and we spent lots of time roaming around, checking out local marinas. Abu Dhabi has five rather small marinas with a large variety of fishing boats, a few day/picnic boats owned or shared by expatriates like us, and just a few larger boats that would be suitable for living aboard.We were amazed that in this summer paradise with yearround sunshine there were very few recreational boaters. Boats are generally used for commercial or semicommercial fishing (there are still a few pearl divers around) or for transport to some of the small islands. As the wealth has increased in the area in recent times, some of the locals have discovered that a nice boat is good for entertaining, and it might also serve as a status symbol. These yachts consist primarily of new Azimuts from Italy; most of the others are locally built in the Dubai area. The local boats don&apos;t usually have the sleek lines or finished look of the new yachts we see in America. In the Arab way, they generally have a large saloon lined with seating cushions, and the galley is not part of the living area. It is usually a small room accessible only from the outside for use by the hired help. Another difference we noticed is in the marinas. They have little interest in offering anything but parking for boats, despite the fact that they charge about the same as marinas in Canada that provide additional services. Although there appear to be some local environmental concerns, we were dismayed to learn that there are no functioning pumpout facilities for pleasure boats in the UAE. We were also surprised to learn that the locals don&apos;t give any indication if their boat is for sale. We saw a few boats that appeared to be abandoned. Many of the larger boats have a "boat boy" who lives or works on board, and we found ourselves talking to them and any marina employees we could locate, trying to determine whether any boats were for sale and who the owners might be. When we expanded our local search to Dubai (just an hour and a half away by car), we found that the few marinas there were similar to those in Abu Dhabi, although we did come across more large boats. After two years of hunting the globe, we finally found the boat project we had been looking for: a 1983 49 DeFever RPH. And it was located right in Dubai! We had met a friend for lunch at the Dubai Creek Golf & Yacht Club and, naturally, we went for a stroll on the docks. We had seen the DeFever the year before, but we had thought that it had a wood hull, so we weren&apos;t interested. That day, we learned it was fiberglass, and we started talks with the owner. Marine surveys are unheard of here, but with Bob&apos;s experience, he figured he could conduct a thorough inspection. We spent several days, clipboard in hand, making a list of the deficiencies, which was good for negotiating. (The owner had said all the boat needed was a little TLC. Ha!) We also performed a sea trial. The boat had obviously been very neglected. Her spongy teak decks had led to severe water damage. On the positive side, she had a good, thick hull, her engines were in pretty good shape, and her transmissions, three marine air conditioners, and generator were relatively new. 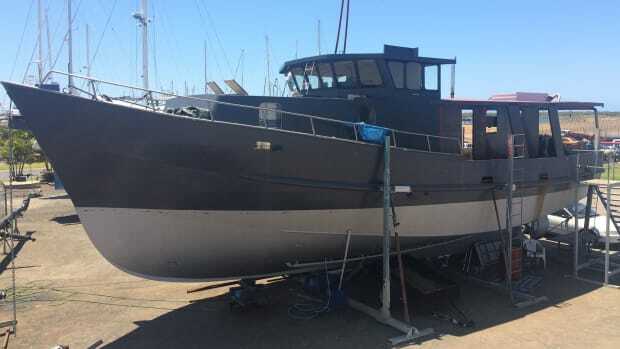 We decided the rest could be fixed, and since this was the way we could best afford a boat such as this, we made a lowball offer that was conditional on inspection of the bottom. The owner agreed to have the boat hauled out and the bottom stripped to the gelcoat so that we could check for moisture and osmosis. We were amazed to find that no one bothers with moisture readings here, so the first piece of equipment Bob bought was a moisture meter. We got some fairly high readings, as expected, but the signs of osmosis were very few and shallow, and we knew we&apos;d have lots of time in dry dock to let the boat dry out. After much haggling, we finalized the purchase in January 2004 with lots of energy and enthusiasm and six weeks&apos; dockage remaining at the Dubai Creek Golf & Yacht Club. This is the most prestigious marina in the country, with lovely grounds, several restaurants, a chandlery, and a sizable shopping area. We spent time searching out and talking with contractors and marine suppliers, finding little workshops in Dubai, and getting quotes for the major repairs.We were given several frighteningly high quotes; it seemed that most of these companies were used to working on megayachts where no expense was spared.We decided to have the major work done at a boatyard in Abu Dhabi, about 20 minutes from where we live. Up until then, this yard had refurbished only local fishing boats and personal watercraft, but we were impressed with the quality of their work, and they assured us they could handle similar projects on a much larger scale. As it turned out, it would prove invaluable for us to be close enough that we could keep an eye on the daily progress and for Bob to be able to do the work he wanted to do himself. We would have to move the boat from Dubai to Abu Dhabi in six weeks, and we only had Bob&apos;s two days off per week to get her ready, plus an almost two-hour drive from home. Our immediate task was to make the boat seaworthy enough for this 11-hour cruise. Fortunately, there was a large commercial boat works located about 10 minutes from the Dubai marina; there we found most of the needed parts and supplies and several very accommodating machine shops for our initial work. The engines, two 120hp Perkins diesels, were in pretty good shape, but during the sea trial we had noticed that there was a little steam from the port exhaust and that the engine was losing coolant. We were fortunate that the local Perkins mechanic was quite competent.We had a top overhaul done on both engines and replaced all gaskets, hoses, belts, and impellers.While that was being completed, Bob worked on various things to ensure a safe cruise home, including overhauling the original vibrationdampening shaft couplings. The next goal was to have a functioning head and fresh water. The water and waste systems were in pretty bad shape, but we were able to make them temporarily usable.We also needed to get the helm and navigation lights working, as we would not have the benefit of 11 hours of daylight for our trip home in February. The genset was a 12.5kWOnan with a mere 740 hours on it, but the muffler was original and definitely finished. Once again, the local shop came through for us. Using the old muffler as a guide, the folks at the shop made a new one from stainless the same day for a very reasonable price. We thought, "Wow! This is going to be an easy project if this is the way things get done here. "We were premature in our optimism. I cleaned the boat inside and out, sorted and located tools, and sorted and inventoried hardware. We got in a couple of test runs on the Dubai Creek, which was very busy with the odd megayacht and floating restaurant/tour boat, many trading dhows (big wood ships) loaded with all kinds of merchandise from neighboring countries, and the crisscross of the abras (narrow water taxis) carrying a constant flow of people from one side of the creek to the other. The backdrop was a mix of tall, shining glass buildings, a refurbished historical area, a cultural village, and the old souks (markets). The extreme contrasts made it like an experience from another world. We hadn&apos;t tackled any of the big, nasty areas of concern yet, but we felt as though we had accomplished a huge amount. After several very windy days, when it came time to leave Dubai, we woke to a surprisingly calm day. Bob was joined by a couple of colleagues and fellow boaters and our Indian cook, who had never been on a boat before but was quite delighted to be included. A mandatory stop at customs at the mouth of the Dubai Creek was interesting. (Such stops are necessary when leaving one emirate for another.) We were the fifth boat rafted off from the crowded dock, and to get to the office Bob had to climb across four big dhows piled high with trading goods. After half an hour, with stamped passports in hand, Bob and crew were on their way. I drove the car back from Dubai and met them at the dock in Abu Dhabi, where we were able to make the short hop from the marina to the boatyard next door to be hauled out. Sanding and repainting the entire superstructure and applying epoxy coating on teak brightwork. The people at the boatyard said they needed a couple weeks to finish up some small jobs before devoting most of their crew to our boat. We were anxious to get the hull dried out, so we talked them into getting one or two men to start stripping and sanding the hull right away. A gelcoat peeler is unheard of here, so an angle grinder was used. It took a lot of explaining to convince the workers to keep the grinder flat against the hull and sand off the gelcoat rather than holding it on edge and grinding off layers of fiberglass along with the gelcoat. The importance of maintaining the flat, smooth hull surface did not have any apparent significance until we offered several generous tips; then, all was clearly understood. We frequently had to confront the tendency of yard employees to perform a task without any regard for the purpose of the task or the quality of the final outcome. Somehow, they never seemed to finish up the small jobs in the yard. In fact, much to Bob&apos;s frustration, new jobs kept appearing throughout our entire project. Since we had rented the space for six months, they didn&apos;t seem to think there was any hurry in getting started. Bob finally resorted to tipping anyone we found working on our boat when we arrived at the yard, much to the chagrin of the owner. Eventually, we got a bigger crew working on the boat, and by the third week the hull was down to bare fiberglass and they started on the top deck. It took a crew of three a full day to remove all the screws in the top deck and several more days to strip the dripping core down to the fiberglass. The delaminated plywood core came off like layers of wet cardboard that you could squeeze water from. We ended up with just the roof of the saloon remaining, as the frame all around it was rotten. Up to this point, we didn&apos;t have many complaints about the workers, the majority of whom were unskilled laborers from India, Pakistan, and Bangladesh who spoke little or no English. At times we weren&apos;t sure they understood the concept of various jobs, like how much to sand. We had to keep a close eye and joked that occasionally we had to let them know that it was time to move along and sand the next spot. We have a friend from India who is an interpreter at a courthouse and speaks several languages (there are about 30 different dialects in India alone). We asked him to come down and talk to the workers on our behalf. 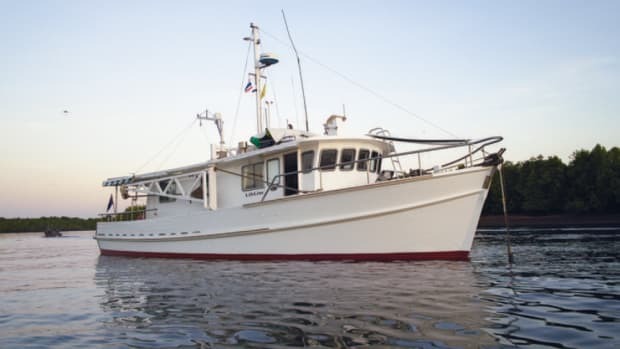 We were constantly trying to impress upon them that this boat was going to be our home, not just some old fishing boat, so we wanted them to work carefully and to do a good job both functionally and aesthetically. Once we got deeper into things, we were disappointed with the way the contractor worked. His regular job was working as a diesel mechanic with the local navy; the boatyard was his personal sideline, so he was only there part of the time. The principle of the culture seems to be taking time for greetings and pleasantries and sitting down for tea, but not addressing negative issues. Therefore, according to the yard, everything was always progressing just fine and there was no need to worry about the timeliness of completion, which we found frustrating. One of the major issues was the lack of a foreman or supervisor other than Bob or me, and we couldn&apos;t be there all the time. Finally, a foreman was appointed: a young fellow who did the bookkeeping! We think that his main function was simply to make sure that everyone kept working. He certainly didn&apos;t have much knowledge about what they were working on. (At the yard, about 10 employees live and bunk together on-site, sharing a couple of hot plates and two very basic bathrooms, and they work 10- to 12-hour days, six days a week.) It&apos;s a good thing Bob knew what he wanted and was familiar with all aspects of the project. Everyone got used to seeing me on the worksite in my old clothes, pitching in and monitoring things when Bob wasn&apos;t around. It seems to be quite unusual for a woman to be involved in such things in this part of the world, and I certainly never saw another woman at the boatyard. We hadn&apos;t run into any major surprises in the condition of the boat, thanks to careful examination before purchase, and we were still quite enthusiastic. The bottom paint and gelcoat were just about completely off, the decks were stripped, and the cabin sole had been removed to expose the water tanks. At long last, we were about to start the major work. We were thankful that our contractor had a good fiberglass man, and once the upper deck had the new frame and new plywood was down on the decks, we were ready for him to do his thing. The plywood was glassed in, and nonskid decking was made in a mold. While this was being done, Bob removed all the portlights and various pieces that he wanted to send out to be re-chromed. By the end of March we had installed a domestic air conditioner to allow us to do the inside work more comfortably. The workers also started sanding down the exterior teak railings, doors, and swim platform. Molds were made for the new fiberglass holding tank, an extended L-shaped bench for the flybridge, and a new fiberglass hatch to the upper deck that was designed to replace the leaking wood one. We decided that the water tanks would also be fiberglass (coated with vinyl ester resin) and would be an integral part of the hull. During the summer, Bob kept his moisture meter handy and we literally watched the hull dry out. PMM had convinced us that an epoxy bottom like the InterProtect 2000 system would be far superior to gelcoat, so early in October, when the moisture readings were low and had stabilized, we were ready for the epoxy coating. A rep from International Paint arrived to oversee the hull&apos;s preparation and to keep an eye on the humidity conditions and the application. We wanted this done correctly, so Bob and I were right there, lying on our backs atop cardboard on the ground, helping to roll it on. Previously, we had watched workers paint the entire 60-foot hull of the boat next to ours with a 3-inch roller. (That&apos;s what fits in the mouth of a paint can, so what else would you use?) We arrived, manned with several aluminum paint trays that we had lined with aluminum foil and reused, and bags of our standard-size rollers. Having the boat&apos;s bottom covered in epoxy was major progress, and we took a break at this point for a 10-day vacation in Thailand, where we did what? Looked at boats that were for sale and in need of rebuild, of course! By March 1 we were approaching our one-year anniversary in dry dock, and Bob was determined not to extend that time. He paid up the rental on the space, arranged for the launch, and informed the contractor (amid much grumbling) that he would have to send his men next door to the marina to finish their last bit of polishing. Our boat looked a little odd without the new stainless on the top deck, but the shine of her brightwork and gelcoat were fabulous and it was great to be in the turquoise water at the marina six months after renting the slip to hold our spot. First we worked at hooking up the plumbing in the main head and getting the stateroom sole down so we could stay overnight. Soon after, we took our first cruise and anchored out in a bay where we enjoyed the antics of dolphins cavorting nearby. That made it all worthwhile and gave us a new perspective for the trials that still lay ahead. We then returned to dry dock for the day and hired a crane to lift the radar arch and stainless steel frame and rails into place. The new upholstery for the wheelhouse and flybridge also was brought aboard (all fabricated at shops in the boatyard). The next week Bob started his month&apos;s leave, and we moved onto the boat. The first job was installing new lights, radar, antennas, and speakers. A new bimini top and canopy were made and installed on the top deck- not finished in the Arab style with lots of cord and eyelets. We officially changed the boat&apos;s name to Dorothy Mae, after Bob&apos;s mother. The attractive gold lettering on the transom completed the exterior&apos;s finished look. All this time and work, and we hadn&apos;t even started on the inside! It was very hard to find people who could do quality woodwork and wood refinishing, but we finally contracted with a company to refinish the entire wood interior. Bob and I spent two days removing all the doors, hardware, and instruments in preparation. It took four men a month to strip and sand all the interior walls. All of the water-damaged wood was replaced. The refinishing became a nightmare as we went through three different companies. The men in charge who knew what to do and who spoke English didn&apos;t show up with the workers, and we couldn&apos;t make the workers understand the need for an absolutely clean surface after the between-coat sanding or for adequate lighting when spraying. The gelcoat man from the boatyard was now working for us. He knew an "expert" at spraying high-end cars and was convinced that, with Bob&apos;s help, they could do a superior job themselves. Since shorter workdays were in effect for Ramadan, the sprayer was available to come in the late afternoon for several hours. Once the walls were finished, we covered the saloon with cardboard, installed an exhaust fan, and used it as a spray booth for the many cupboard doors. Since we weren&apos;t happy with the finish the woodworkers had attempted and we wanted something durable, we ended up using a three-part mix of acrylic urethane with some stain mixed in. The spraying process took two and a half weeks to complete; then, every surface was thoroughly sanded with 2,000- grit paper and polished. 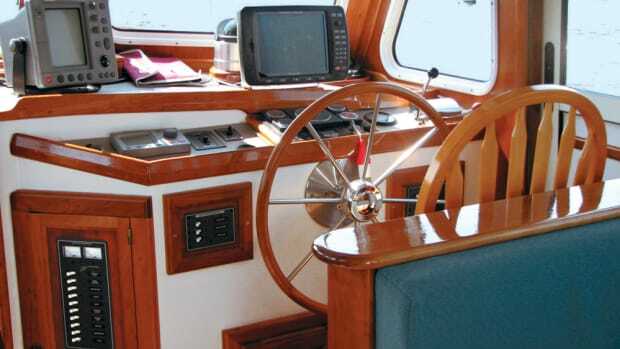 Wow-when that was finally finished, we had a glossy cherry wood finish throughout the boat that would look at home on the finest custombuilt yacht! We contracted out to have padded vinyl panels made and installed for the overheads throughout the boat. This company turned out to be the most professional we had dealt with yet. We were very impressed when Aziz, the man who came to discuss the job, showed up five minutes early, wrote down appointments, and returned to supervise the job, or at least check up on the work being done. Now we were ready to tackle the galley and heads. We made a trip to the marble shop-not a store, but a huge shop where they did all kinds of detail work. We were free to walk around and see how they made intricate patterns and cut detailed pieces using a waterjet cutter. Rather than just look at samples, we walked through rows of huge marble slabs in the yard outside and picked the ones we wanted our pieces cut from. We selected granite for the new barbecue cabinet on the upper deck and for the galley counter, and marble for the head countertops and sole. We finished off the main head, but left the second one as our last job. We made major upgrades in the galley, including a ceramic cooktop with touch controls and a microwave/convection oven built in below it. Later, we added a large drawer for pots and pans below that. We extended the granite countertop across the engine room access hatch, just leaving the vertical door for access. When we hit our second anniversary in early January 2006, the interior wood was finished (except for a bit of trim), new overheads and lighting were up, and the galley and main head were 90 percent complete. Regrettably, we had to go back outside and refinish all the exterior wood. Although it had looked great, the UV protection additive had not been added to the WEST System epoxy, and with the year-round sunshine, all the finish was peeling. Because it was rather disheartening to redo such a big job, we alternated with inside jobs so we could continue to see some progress. We sanded down the solid teak parquet and refinished it. Bob didn&apos;t trust anyone to help with the sanding, and with the many coats required, the brightwork seemed endless. My job was cleanup and taping, which was no small task, since the tape&apos;s adhesive would bake onto the gelcoat if left on more than a day or two. While various coats were drying, we put back all the doors that had been removed, updated electrical switches and outlets, and installed blinds. In the galley we installed a new full-size refrigerator (with an inverter) and the electric stove top and oven. Bob put extra supports in the barbecue cabinet and installed the granite top, barbecue, and two-burner propane cooktop. We bought an Lshaped pullout couch, carpet, and a floor lamp for the saloon. (We have an Ikea!) What a difference all that made. It was finally looking like a comfortable home. We finished the brightwork just as it was starting to get unbearably hot, and we were really sick of it. Over the summer, Bob managed to do the troubleshooting on a generator problem (with some long-distance help from a friendly shop in Orillia, Ontario) and replaced the voltage regulator and rectifier pack. He also had the stateroom air conditioning repaired, had two new drawers made for the galley, and installed doorknobs and magnetic latches.We had a few more "fixes" in the fall, such as changing the toilet in the main head to a quiet flush electric one that uses fresh water, and installing new hot-water hose in the galley. Later, we ended up changing all the cold-water hose to hot-water hose.We had used quality hose, but the extreme heat was expanding the hoses and causing splits. We also installed tank monitoring systems for the holding and water tanks. Bob made a new dual station wiring harness for the searchlight controls and installed the light and controls. He also installed the GPS and a replacement depth sounder. (The sun and heat had cracked the face of the original one on the flybridge.) Finally, we put in the marble and finished off the second bathroom. The last step in completing the interior was adding carpeting to cover the painted plywood sole in the stateroom. Voila! Home at last. We had just reached the third anniversary of purchasing Dorothy Mae, and on that day we declared the boat officially finished, with 710 photos documenting each step of the project. Of course, as you all know, a boat is never completely finished. Bob is eager to get to some "fun stuff " in the engine room, like installing a fuel polishing system, rewiring, and so on, but at least the restoration part is complete.We have to admit that it was a far bigger project than we had anticipated. Not that we ran into any surprises regarding the boat, just the constant battle trying to get a quality job done. As I look back in my journals now, I see many things that should have been quick and painless but definitely were not. I often heard Bob say, "There is no such thing as a small job." Bob worked his regular job full time throughout the project and devoted every moment of his time off to completing the restoration of the boat, almost to the point of exhaustion. Would we do it again? I&apos;m quick to say no, but Bob says maybe-if he weren&apos;t working full time as well. He feels strongly that he could not have overseen this project to such a satisfactory end without the valuable technical information provided in PMM. Also, special thanks are in order to Ron at Nat&apos;s Marine Supply in Pickering, Ontario, for his support in obtaining many high quality items at very reasonable prices. We&apos;ve had some very interesting luggage on trips back. We&apos;ll have to put the work behind us for a while and get some more enjoyment from the boat before we decide whether another restoration project is in our future. We have managed the occasional cruise and overnight anchor to remind us what all the work was for, and certainly, the breathtaking beauty of the turquoise sea, white sand, and dolphins is a just reward. Now, donning the new scuba gear to scrape barnacles doesn&apos;t seem so bad!